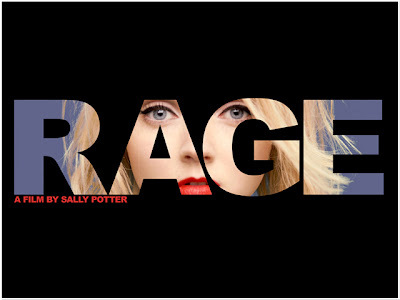 Defying the usual conventions of film, RAGE is the new cinematic creation from writer-director Sally Potter. Using a radical narrative structure focused entirely on individual performances, RAGE consists of a dynamic series of interviews, as if shot by a schoolboy on his mobile phone. He goes behind the scenes at a New York fashion show during a week in which an accident on the catwalk turns into a murder investigation. Fourteen actors, both celebrated stars and emerging talents, play characters who each have a role in the show, from the designer (Simon Abkarian) and his models (Lily Cole and Jude Law), the fashion critic (Judi Dench) and photographer (Steve Buscemi), to the fashion-house financier (Eddie Izzard) and his bodyguard (John Leguizamo). The radical style of RAGE is embraced in its unique distribution strategy, with the film premiering on mobile and internet alongside its digital screen and DVD release. The premiere event will be broadcast live from BFI Southbank. You can be part of the satellite Q&A by sending your questions via Skype video and SMS to Sally Potter and members of the RAGE cast, including Jude Law, Eddie Izzard and Lily Cole (line-up TBC).